The company brags that 90% of their clients get a job within four weeks, and judging by the quality of their work, it is not a difficult statistic to believe. They are a small but hardworking group, and their website downplays their brilliance to a massive degree. They offer resume writing services, and a range of other services to help you get a job. The resume writing service has experts in IT, administration and customer service, finance and accounting, HR. mining, construction and trades, engineering, medical, the public sector, nursing and allied health, communications, arts and media and sales and retail. Their main services involve resume and CV writing. They will also edit your CV/resume for you, and they will write your cover letters. They will write your LinkedIn profile for you and work on your selection criteria responses. They have a blog that they load with tips, and they have interview coaching too. They have services to suit graduates, professionals, executives, and people looking to work for the government. They have a resume writing workshop you can try, job-searching advice, preparation coaching, and they are able to rewrite your current CV too. Their graduate package costs AU$295, their professional package costs AU$395, and their executive package costs AU$495. 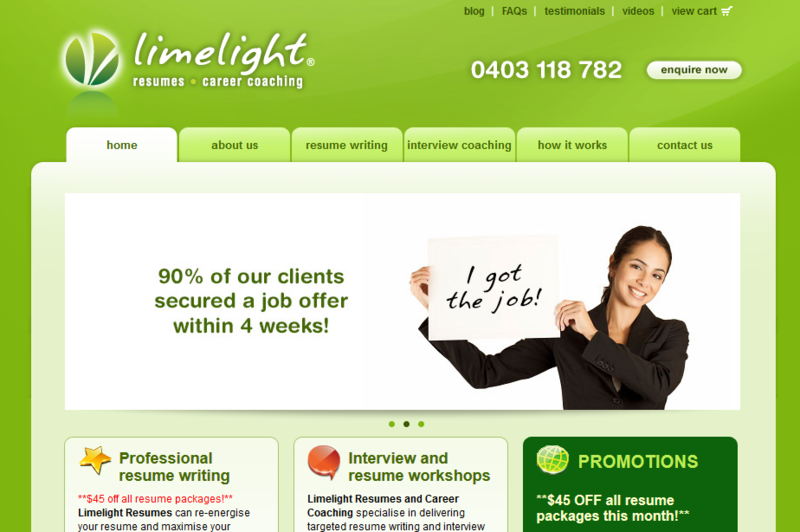 If you want to make changes to an existing resume, including one that Lime Light wrote for you, then it will cost in the region of AU$75 per hour. A LinkedIn profile will cost between AU$140 to AU$260. The Government Selection Criteria Responses services will cost AU$75 each. An additional cover letter for your CV will cost you AU$475. There are toggle buttons you can click to get the price of other service variants, such as if you want your service within the next 48 hours, then you will have to pay an additional AU$90. They have a very reasonable graduate package, professional package and executive package that you may be interested in. they have a government selection criteria responses selection package and they will even write you a networking resume. The resume writing company doesn’t have discounts so to speak, but they do offer a slightly lower price upon purchase. You can see on their prices page how their previous prices have been struck through and are replaced by the prices you will have to pay (in a red font). If you do not see the service you require, you can make contact with them and get a quote of your own.